Jose, our Blue and Gold Macaw. One of the culprits who chewed the cages up! We were stationed in Panama Canal Zone (1960’s) and my Dad was the XO at the Marine Barracks. (He later became CO). He decided to make these beautiful parrot cages, to house the beautiful parrots who decided to join our family. 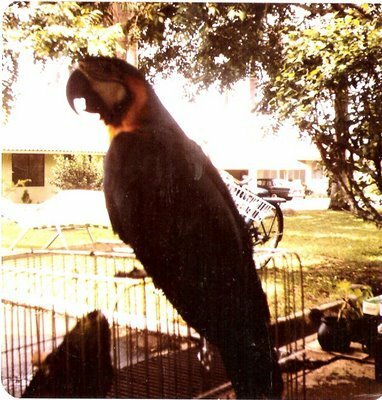 We let them fly during the day, but at night, my Dad wanted to corral them so they wouldn’t get into any “trouble” with the monkeys or the neighbors. Dad went to the woodshop that was part of Special Services, and passed his certification test to use the equipment. Special Services was the group in charge of building the morale of the troops and dependents on military bases. Dad then decided to use dowel rods to make the bars on their cages. He ordered maple wood for the frame and maple dowel rods from Maine (mail order), and we had to wait about 6 weeks to get the wood. The wood finally arrived, and my Dad ‘went to town’ building beautiful cages. Everyone came by our quarters to see the cages. We had an impromptu cage party, which pleased my Mom because she loved to entertain. Dad promised a few other people he would make them cages, too. We went to bed for the night. The next morning when we woke up, our beautiful maple cages were saw dust and the birds were flying all over the house, eating the furniture, “pooping”, screeching, and just having a grand time!!! We “gringos” didn’t understand parrots love to chew wood~~ especially fine maple wood from Maine! Were we the ‘talk of the town’ when the local people found out what happened. The “locals” called my Dad “Major Parrot” as a joke, which my Dad took quite well. That was the last time my Dad used the wood shop. !!!! (My Dad actually built one more, HUGE cage using chicken coop wire which corraled all the assortment of birds we aquired while living overseas. Jose graduated to a perch inside the house…which brings to mind more stories of the mischief he got into. Another day~~another blog post, LOL). This entry was posted in My Ancestors and tagged ancestors, BareBones Genealogy, biography, bird cages, Burritt, elkhart county indiana genealogy, macaw. parrott, Maine, Maine maple wood, maple wood, millitary bases, oral history, Panama Canal Zone, research, Special Services, US Marine Barracks Canal Zone, why genealogy is important. Bookmark the permalink.